If you like offense — and really, most people prefer 54-51 to 13-10 and those who say otherwise might be pining more for nostalgia than gritty field position battles — Monday was your kind of night. 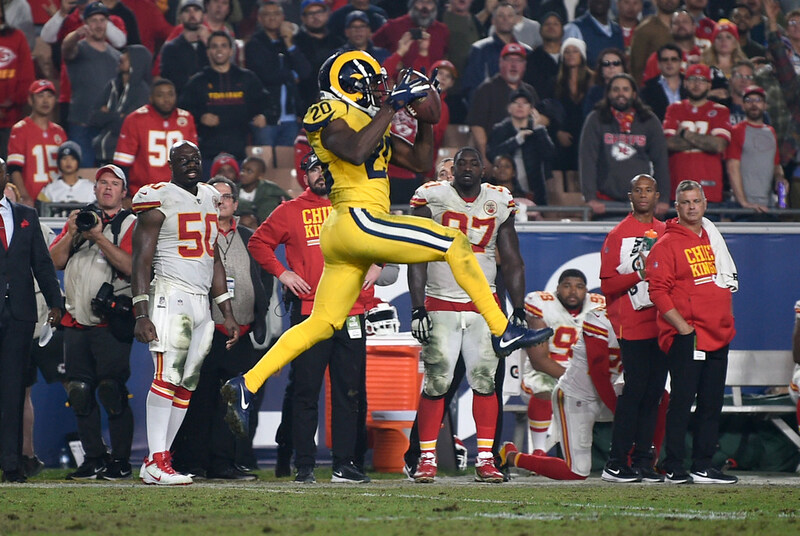 *In what looked at times Monday like a video game, or at least a Big 12 game, the Rams and Chiefs combined to score 105 points on Monday Night Football. Los Angeles gave up 51 and still won, thanks to a late touchdown that gave the Rams 54, putting an exclamation point on a showdown between explosive 9-1 teams that absolutely lived up to its billing. If you run a casino in Las Vegas, however, Monday was not your kind of night. In an effort to scare away gamblers, the over-under point total for the game was set at 64 — the largest since at least 1986. But gamblers — especially casual ones who like to have a few bucks on a game for fun — love the over. It’s more fun to root for points than to hope for turnovers, incomplete passes and field goals. ESPN reports that a representative for William Hill, which has 108 sports books in Nevada, said 69 percent of the over-under action in Monday’s game was bet on the over and that the books lost seven-figures Monday as a result. Nice for gamblers, not nice for the money machines. Let’s just hope those poor, poor casinos can rebound. *Vikings coach Mike Zimmer offered up some very interesting quotes Monday that further advanced my theory that there is some push-pull happening this season between the way Zimmer wants the Vikings to play and the way new offensive coordinator John DeFilippo is calling games. *QB Kirk Cousins has thrown seven interceptions and lost six fumbles this season, meaning he’s had a direct hand in 13 of the Vikings’ 16 turnovers. Zimmer said he has talked to Cousins about the turnovers, but overall he praised the QB. Case Keenum last season, per Pro Football Reference, threw seven interceptions and lost just one fumble in 14 starts. Cousins has been an overall upgrade in most ways, but ball security has not been one of them. *The Wizards have taken over for the pre-Jimmy Butler trade Timberwolves as the NBA team in the most disarray. John Wall was fined for swearing at head coach Scott Brooks recently (strangely, I don’t recall Butler being fined for similar antics). Bradley Beal reportedly is fed up with management. And every player, including Wall and Beal, is available via trade. Deadspin’s Albert Burneko wrote a searing piece about the awfulness, and it sounded so much like the Wolves earlier this season that it was eerie. *And finally, Blues coach Mike Yeo has been fired. It took three shutouts in four games, but it happened. He coached in St. Louis for parts of three seasons, but only one full one.